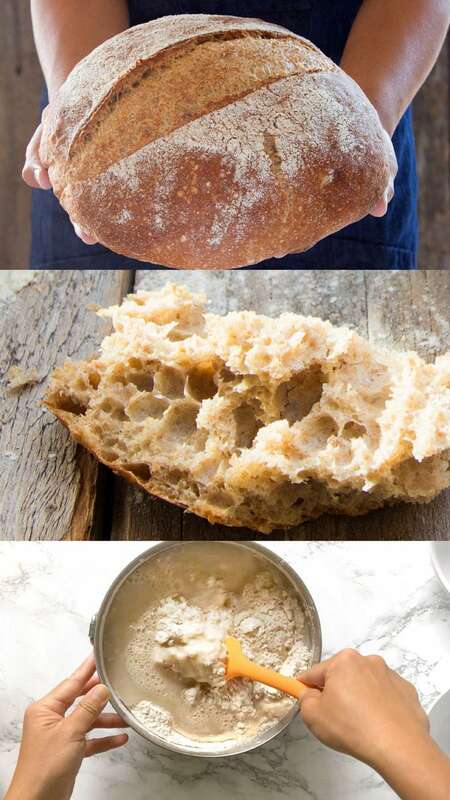 With this super easy no knead bread recipe, anyone (yes ANYONE ) can bake an outrageously delicious, warm, fresh loaf of bread straight from their home oven with almost no work! 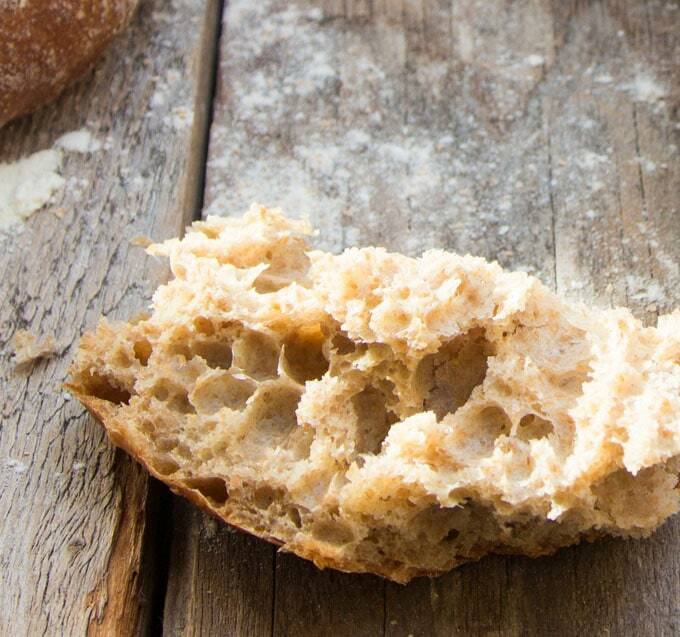 This fool proof homemade bread recipe requires just 1 bowl and 4 ingredients. We have included variations of traditional all white flour bread and healthy whole grain bread recipes. All we need to do is stirring the ingredients together and then allowing time do the rest of the hard work: developing aromas of fermentation and a beautiful bread crumb structure. 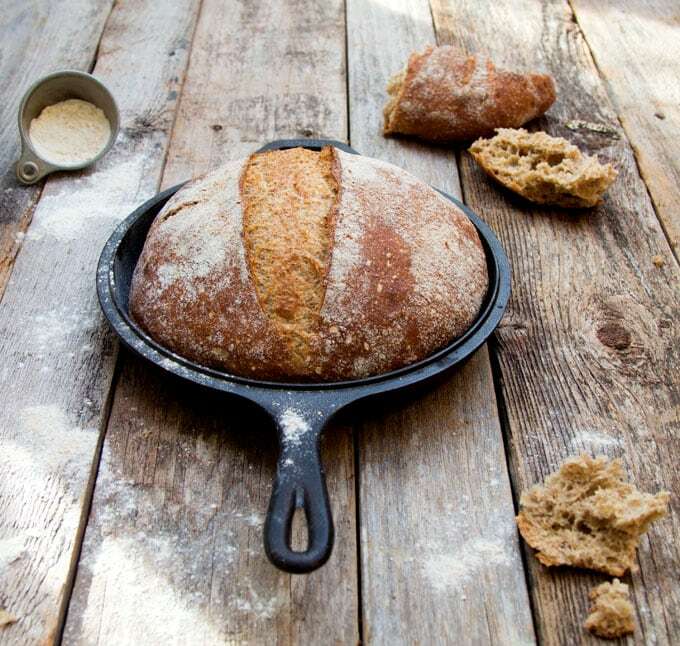 Our Dutch Oven no knead bread recipe uses 50% whole grains in the form of whole wheat flour to make a light whole wheat bread that is more nutritious and full of flavor. We have used this homemade bread recipe to make spelt bread, olive bread, cheese bread, and more! We will provide variations at the end if you want to make 100% white or 100% whole grain bread. Although the process is simple, this is a very detailed tutorial with video, step by step instructions, and lots of helpful tips and FAQs at the end! 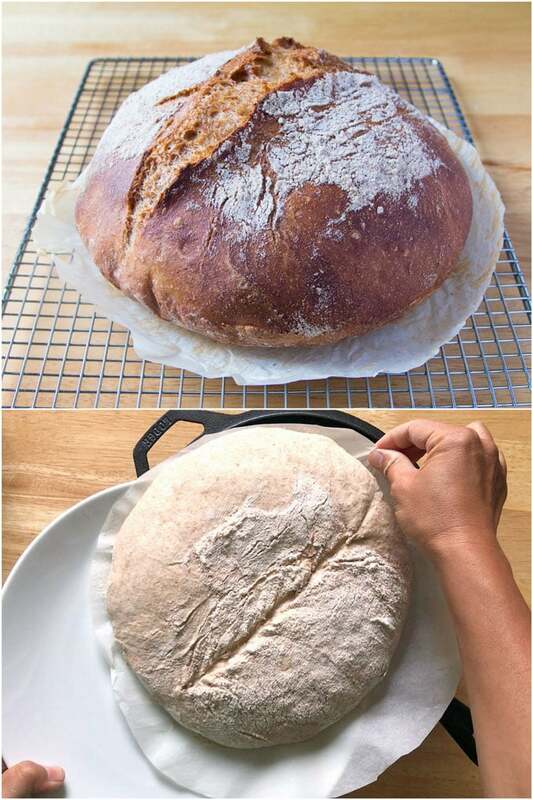 You can check out the whole process of this easy homemade bread in this quick 3 minute video below, or skip to step by step photos and instructions next! When making bread the key to success is having the right proportion of flour to water. Flour can become densely packed when we scoop with pressure using a cup. Here’s a technique for measuring flour that gets more consistent results: use a spoon to scoop the flour then loosely fill the the measuring cup so the flour stays fluffy. 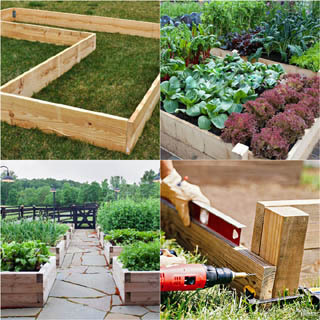 Scrape the top level using a flat edge like chopstick or the top edge of a knife. Add all of the ingredients to the bowl and stir until well combined. There should be no dry flour. The mixture will be very wet. This is a key part of the recipe, which is designed to allow the dough to come together with time. As the dough sits overnight the flour will continue to absorb water and firm up. Since we are using 50% whole wheat flour, wet is even better because whole wheat flour absorbs more water than white flour. Cover the dough and leave it at room temperature for 2 hours. Now you can put it in the refrigerator for 12-24 hours, then go to Step 3, or check out the OPTIONAL Step 2. You can skip this step and go to Step 3. You will still get a beautiful loaf of homemade bread. 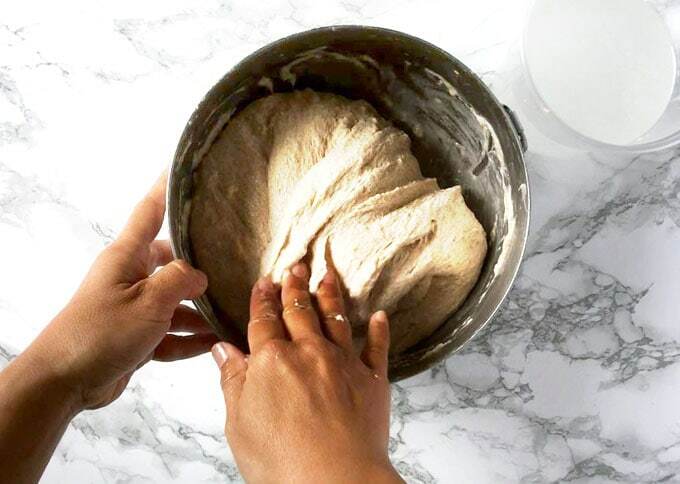 However, we want to share an optional easy step that we think adds strength to the dough which results in a higher baked loaf with slightly better volume, and a slightly lighter crumb. After leaving the dough one hour at room temperature, grab the edge of the dough pulling it up without tearing it and then folding into the center of the dough. Continue to work your way around the edge until you’ll brought every edge over to the center. It’s like grabbing the points of a star. When you’ve made it all the way around the bowl turn the dough over. Then cover the dough again and leave it for one more hour. Now it goes into the refrigerator for 12-24 hours tightly covered. Dust the countertop with a coat of flour and turn out the dough. You do not need it to warm up first. 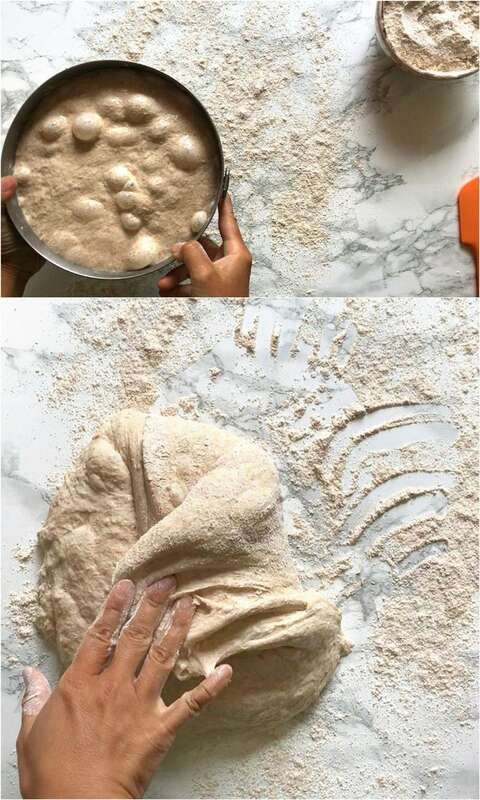 Now gently fold the edges of the dough into the center of the mass to form a compact, round like shape. Now prepare a similar size bowl (8″ wide x 4″ high) or the same bowl that has been rinsed and dry, by lining it with a sheet of cheesecloth. Then coat it with a dusting of flour. Be generous as you can brush it off later. Pick up the dough and drop the smooth side down into the cheesecloth lined bowl. 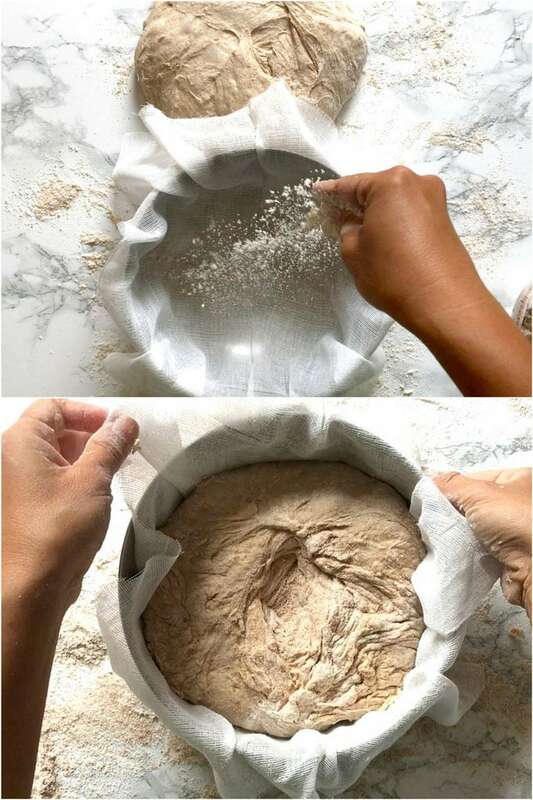 The bowl will help the dough hold it’s shape, a helpful trick for such a soft dough. The cheesecloth keeps it from sticking. Of course, if you have a bread proofing basket feel free to use it. But you can do the same with the bowl and cheesecloth, which can be washed, dried, and used again. You can also let the no knead bread rise on a piece of parchment on a flat pan. The dough will spread and the bread will probably be a little flatter. Be sure to put the smooth side of the rounded dough on top. Cover the dough with a damp towel of plastic to prevent a drying. Leave to sit for one hour at room temperature. Thirty minutes after shaping the whole grain bread, place a Dutch Oven Combo Cooker on a shelf in the bottom third of your oven. Be sure that there is enough room above to fit the cooker with the lid on. It does not need to be covered during the preheat but both pieces should be in the oven. Turn on your oven to 425°F to preheat. The lid will actually hold the bread and the bottom will act as a cover. One hour after the loaf has been shaped prepare a piece of parchment as shown in the video by placing it onto a 10-12” round plate and trimming the edges to fit. Lightly flour the top of the dough in the bowl and carefully, but quickly, turn it out onto the parchment. Slowly peel away the cheesecloth. If there is an excessive amount of flour feel free to brush some off with a pastry brush. This can also be done after baking. Pull the Dutch Oven top and bottom out of the oven and place it on a heatproof surface, someplace safe. Now, carefully cut the loaf across the top with a sharp razor or knife. We use this Bread Scoring Lame with Protective Cover or this Breadtopia Bread Lame that has a fun baguette handle. The faster you pull the blade along the surface of the dough the less likely it is to stick. Dipping the blade in water may help the blade slide easier. Just remember to keep your fingers out of the way!! You can also go over the cut again if the first try didn’t cut deep enough. Slide the bread with the paper onto the lid of the Dutch Oven . Place the bottom on top. Return the whole contraption to the oven. The bread should bake, covered for 25 minutes. Then take the cover off and return the no knead bread to the oven for 30 minutes more. When baked the whole grain bread will have a nice brown color and have a nice crust. 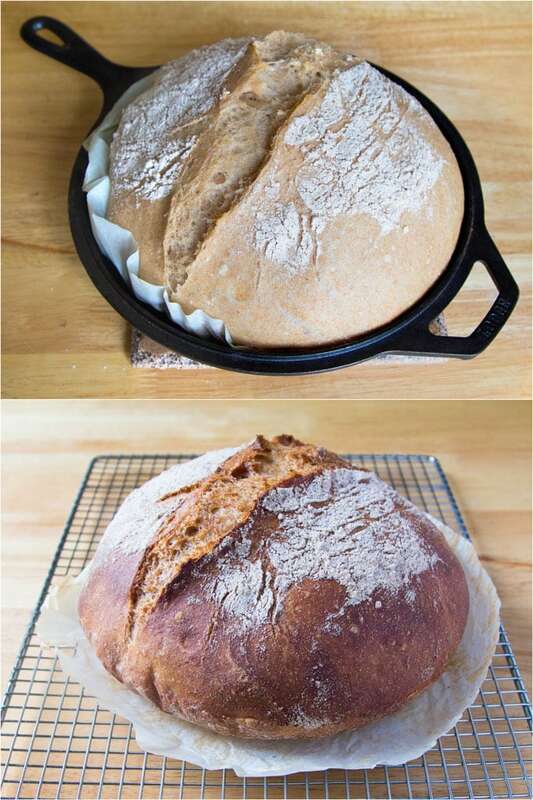 Remove the Dutch oven with the bread and carefully transfer the loaf to a cooling rack to cool. If you leave the bread on the pan to cool you will risk condensation and a wet bottom crust. Time to enjoy this delicious no knead bread! 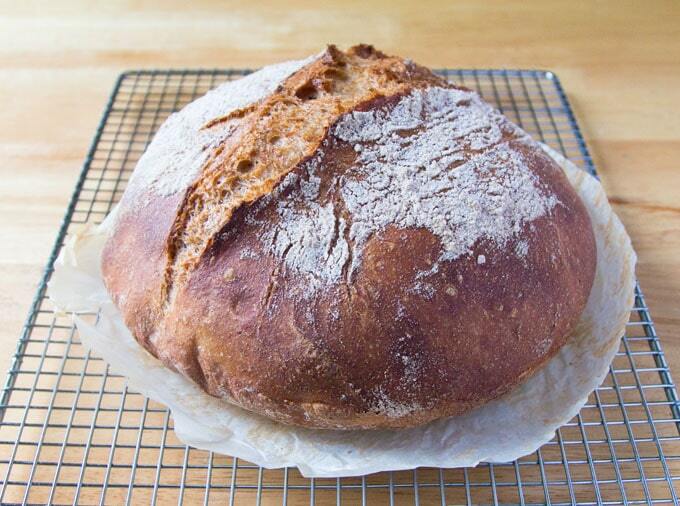 The flavor will be better when the bread cools but who can resist breaking into a hot loaf! Grab some butter, olive oil, jam, etc. 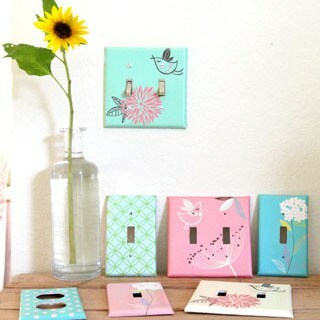 and enjoy! For a perfect 30 minute meal, try it with our favorite golden potato salad with eggs and nutritious greens! Can I increase or decrease the size of the recipe? This is possible but we suggest not increasing the batch by more than two times or decreasing it by more than half. 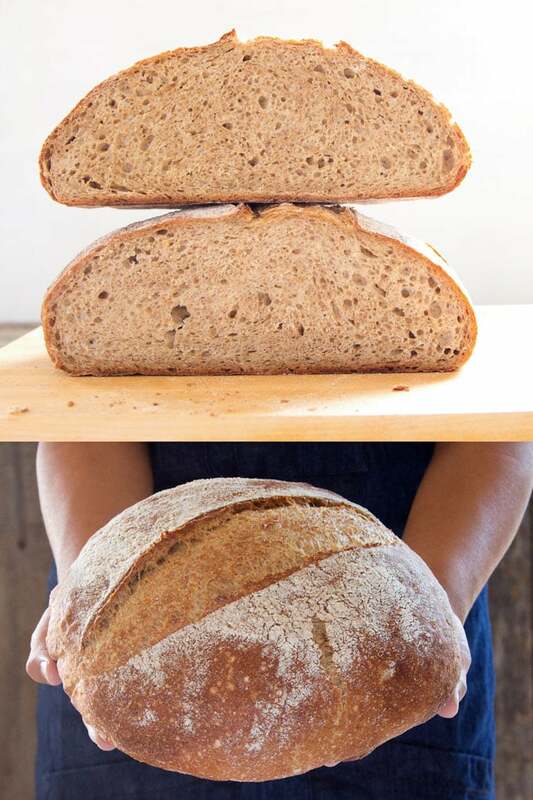 You can also make the same size recipe and make two or three smaller loaves. Just remember if doing that, the baking time will be shorter. Also, if you only have one Dutch oven, you will want to delay the final rise by placing them in the refrigerator so they don’t rise too fast while the first loaf is baking. 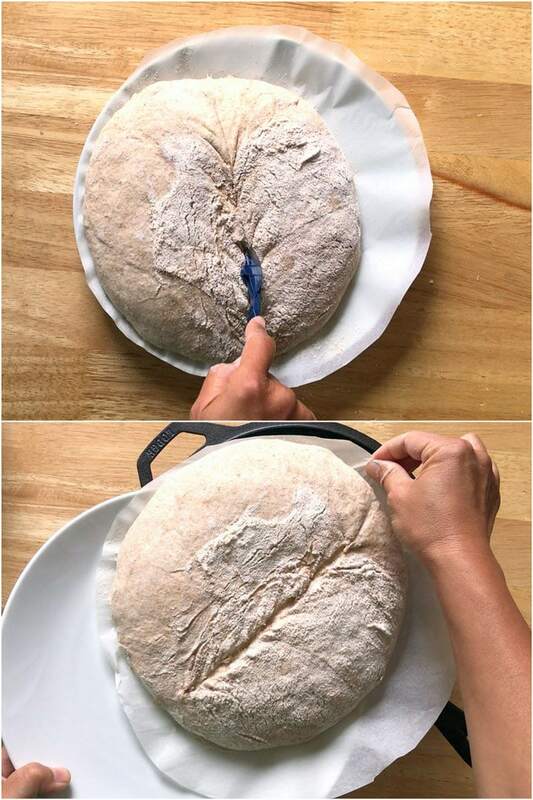 We recommend after shaping, leave the first loaf out on the counter, and place the others in the refrigerator. Remove that loaf from the refrigerator when the first loaf goes into the oven. 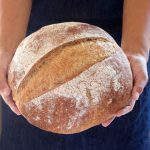 Can I use active dry yeast to make no knead bread? Yes. Active dry can be used in the same quantity and method. 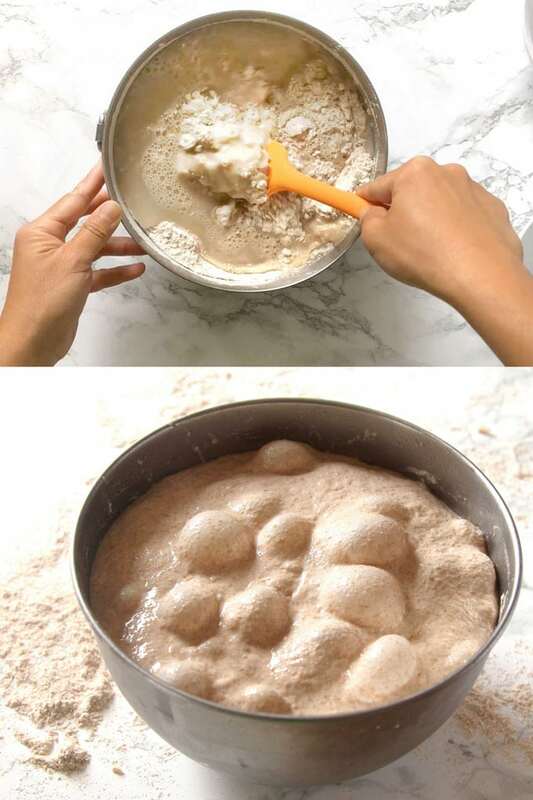 Instead of mixing the yeast in with the flour, dissolve the yeast in the water. This will get the yeast moving faster than if you were to stir it into the flour. Can I use fresh cake yeast to make homemade bread? Yes, if it is available in your area and this is what you prefer you may use it. It is a little trickier to measure. Fresh yeast is generally sold in 2-ounce blocks. For the quantity of flour in this recipe you will only need about ¼ ounce or 1/8th of the block. That’s about 2 ½ tsp. Fresh yeast, also referred to as cake yeast, compressed yeast, or sometimes wet yeast works great but it has a short shelf life and can be hard to find. To use it in this recipe mix it in with the flour or dissolve it in the water. Can I use all white flour? Can I use all whole wheat flour? Yes. Use 4 ½ cups of white bread flour and 2 cups of water, OR use 4 ½ cups of whole wheat flour and 2 ¾ cups of water. You may have to adjust the water after some trial and error because different flour have different hydration characters . Can I make gluten free no knead bread? We have not made this recipe with a gluten free flour but the technique of putting the dough in the refrigerator overnight should work fine. If you test it with gluten free bread mix, please let us know in the comments! How many days can the dough sit in the fridge before I bake it? We usually only go for 1 night but similar recipes say that the dough can last up to a week. 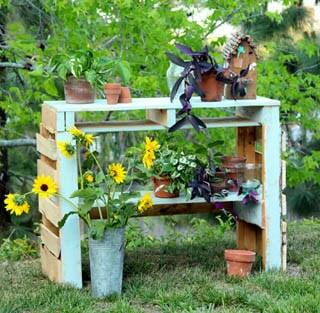 Give it a try! Can I bake no knead bread in a loaf pan? Absolutely. Instead of forming the loaf into a ball, roll it into a log and place it in a greased loaf pan with the smooth side of the loaf facing up. Let the loaf rise for one hour as instructed. The bread does not have to be cut before baking but if you do cut it with one long cut down the middle you will get better volume. Place it on a baking sheet in the oven. Spray the top of the loaf with water before baking. 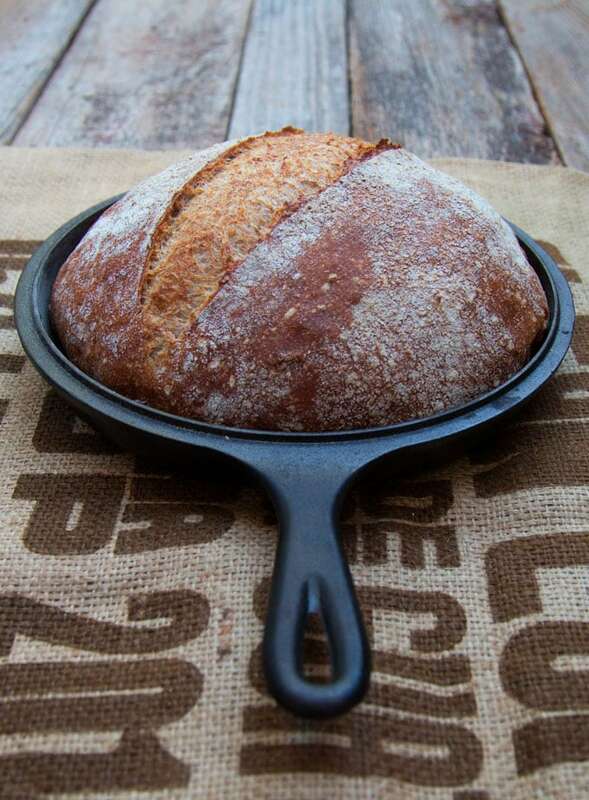 You can use any similar size, heavy duty casserole or stewing pan to bake homemade bread. The Dutch oven transfers heat immediately to the bread causing the loaf to get a good jump in the oven. It also creates a moist environment by trapping the steam from the dough as it gets hot. This keeps the surface of the loaf moist, allowing it to expand as much as possible. When you lift the cover off, this is when the steam escapes and the crusts starts to form. At this point the loaf has risen as much as possible. 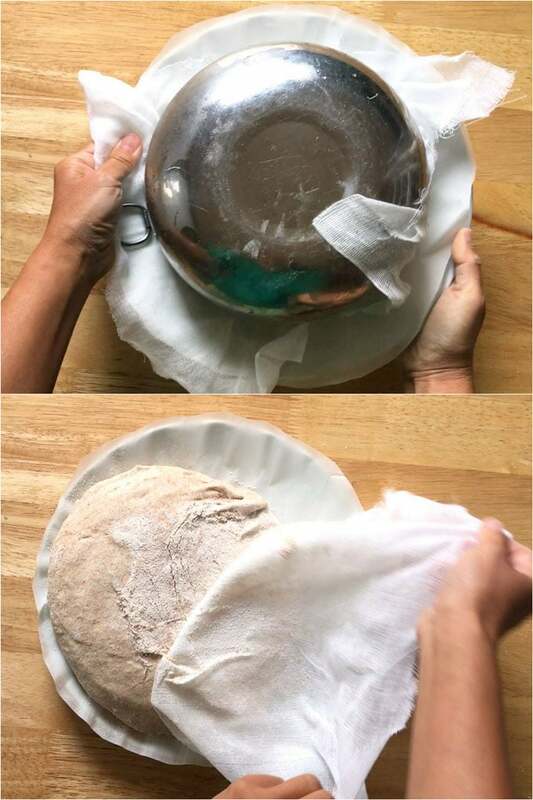 A pizza stone that has been preheating in the oven or a baking pan will also work but it is helpful to spray the loaf and oven walls with water 2-3 times during the first five minutes of the bake. Be very careful not to spray any glass windows or light bulbs to avoid them cracking. If you make this recipe, tag us on Instagram @apieceofrainbow. We would love to see it! Gather the flour, yeast, and salt in a 2 ½ to 3 quart mixing bowl. You can use stainless steel, glass, or ceramic. Stir the ingredients together. Add the warm water and stir to combine. Cover the bowl with plastic wrap and leave at room temperature for one hour. OPTIONAL step: After one hour fold the dough as shown in the video. Cover the bowl again. Leave at room temperature for one hour( 2 hour total ). place the covered dough in the refrigerator for 12-24 hours. Turn the dough out onto a lightly floured board or counter. Rinse and dry the bowl. Line it with a single piece of cheesecloth, and dust with flour. Shape the bread into a round ball and place it smooth side down in the cheesecloth lined bowl. The bowl will keep the dough from spreading too much resulting in a nicer loaf of bread. Cover the bowl with a damp towel and let rise for 1 hour at room temperature. After the dough has risen for 30 minutes, place a dutch oven or other heavy duty 8qt pot on a rack in the lower third of the oven. Turn the oven on to 425°F to preheat. One hour after the dough has risen it is now time to place the bread in the oven. Watch the video to see how to prepare the parchment paper and transfer the loaves. When scoring the bread be sure to use a sharp razor blade or knife. Using a swift motion will make a cleaner cut. The cut will allow the bread to expand better. Transfer the loaf to the hot pan and cover. Bake for 30 minutes. Uncover the loaf and continue to bake for 40 minutes. The loaf should be a deep golden brown. Time and temperatures may vary with different types and brands of ovens. Remove the loaf from the pan and place on a rack to cool. Slice and enjoy! 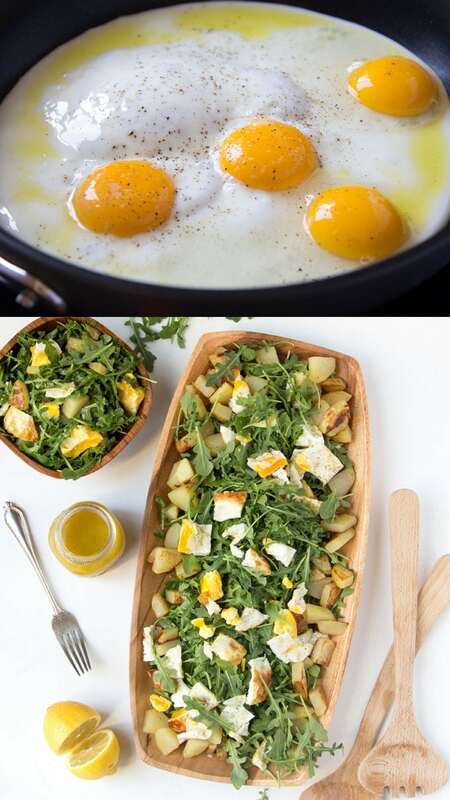 For a perfect 30 minute meal, try it with our favorite golden potato salad with eggs and nutritious greens! If you make this recipe, tag us on Instagram @apieceofrainbow. We would love to see it! I have always wanted to make fresh bread. This no knead bread looks amazing and feels achievable to me! Excited to try it this week! Thank you! I love fresh bread! I’ve only ever made it in my bread machine, but would love to give it a try by hand like this one day! 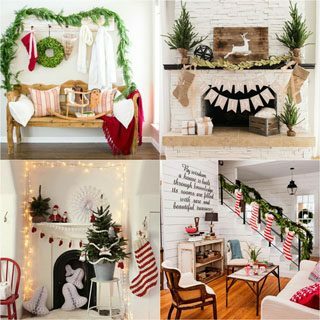 Okay, that looks amazing! There is nothing like fresh bread but I’ve always been nervous about making my own. You make this sound easy enough for me to want to try! 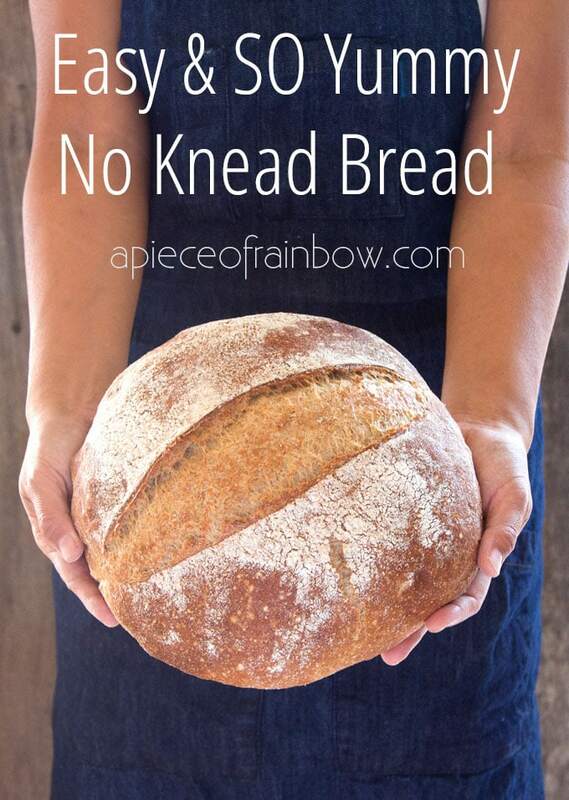 I definitely need to try out this no knead bread recipe for my family. I really like how nutritious it is with whole grain, and how delicious it looks! homemade bread is the absolute best! I really need to make it more often. This recipe sounds great! Tried many other recipes over the years and they all were failures till I tried this wonderful recipe. Many thanks for sharing this. Would cranberries, nuts or raisins create problems when added?? thank you lorraine! 🙂 nuts and dried fruits would work fine as long as they are not a huge amount which would weigh the dough down. raisins can be dry and it is a good idea to rinse them the night before and keep covered so they can plump up a little. happy baking! what are the temperature and baking time if bake it in loaf pan? hi ! it depends on the size of the pan. if it’s one pound loaf pans, it would take about 45 minutes at 375.